The best way we can think of to get customers into your gas stations is by offering complimentary fuel. The next best way? Lego Ferraris. For a limited time, Shell gas stations are offering six tiny Lego Ferrari kits when you fill up your tank. Unfortunately to take advantage of the offer, you need to gas up in Hong Kong. 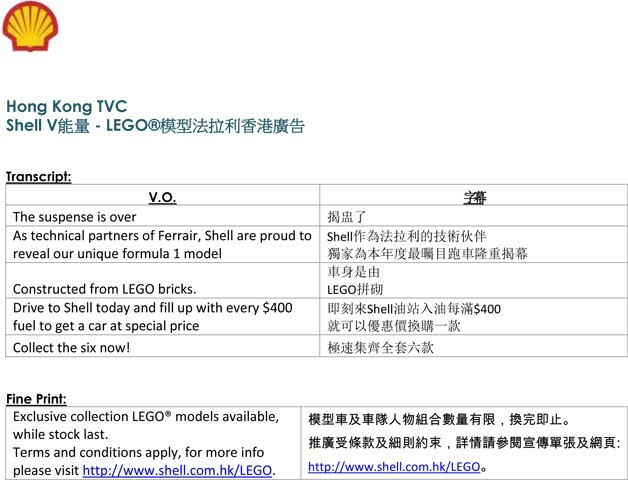 Though we don't yet have official word from Lego or Shell, there doesn't seem to be a plan to make a similar offer here in the States. But you can virtually build and drive the six models on Shell's Website. Choose from the Scuderia Ferrari Truck, an F40, 150° Italia, 458 Italia, FXX, or a 250 GT Berlinetta. If virtual Lego building isn't enough for you, these should materialize on eBay soon enough. Check out Shell's promotional video of the deal below. A transcript provided by Shell is also available.